Astronaut Harrison Hagan Schmitt takes rock samples from the surface of the moon during America's last lunar landing mission of the 20th century, Apollo 17. A long-lost, highly valuable Moon rock brought back from the Apollo 17 mission has turned up in the files of Bill Clinton. The rock was one of 50 presented to each state, and was given to Arkansas while the ex-president was governor. The rock, worth millions of dollars, had been missing since at least 1980 until an archivist found it in old gubernatorial papers. Bobby Roberts, director of the Central Arkansas Library System, told Reuters the archivist opened a box previously archived as "Arkansas flag plaque." The rock and a state flag were originally affixed to the plaque, but the rock had fallen off and the plaque had been misplaced. 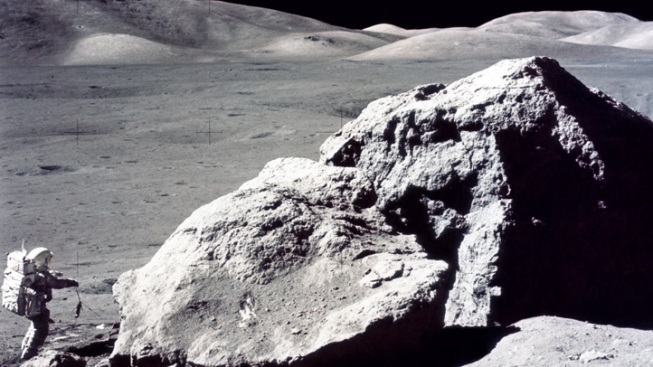 "The moon rock, which is in a plastic container, had fallen off the plaque," Roberts said, explaining that the rock was at the bottom of the box. "The archivist immediately knew what he had discovered." The rock was originally presented to Arkansas Gov. David Pryor in 1976 and hung in the governor's office during the term of Pryor's successor, the future president. Roberts figures that when Clinton lost his bid for re-election in 1980, everything got packed up and the plaque and its rock from outer space were misplaced. Other states have misplaced their Apollo 17 Moon rocks, including New Jersey ad Alaska. Last year, former Colorado Gov. John Vanderhoof admitted he had kept his state's rock, and agreed to give it back.